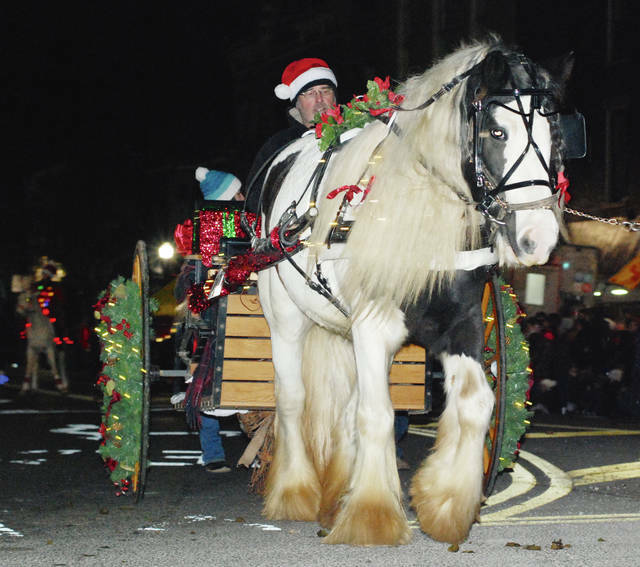 Horse-drawn wagons and carriages, like the one pictured above, brought Christmas to downtown Urbana in traditional style Friday night. 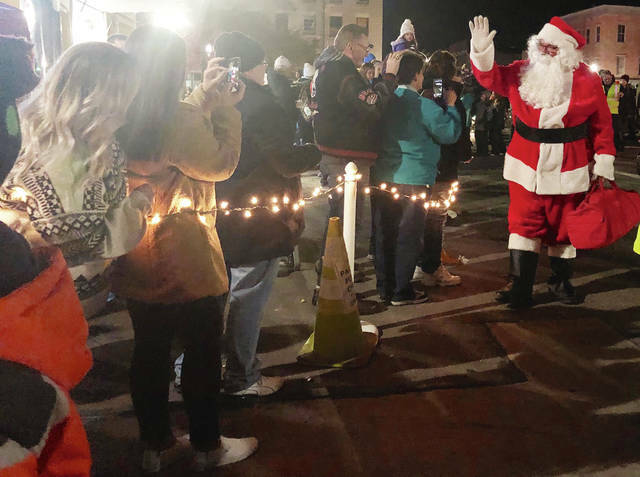 Santa arrives along a lighted rope line and is greeted like a celebrity after Friday night’s Holiday Horse Parade in Urbana. 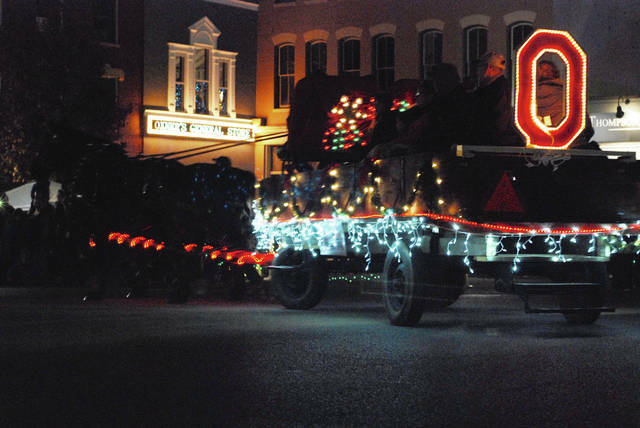 ‘Twas the night before the annual Ohio State football game against rival Michigan, and one parade unit couldn’t resist displaying a large Block “O” in Christmas lights as the wagon wound around Monument Square on Friday night. Equestrian units of all sizes delighted adults and children along the parade route Friday night in Urbana. Riders on horseback, all dressed up for Christmas, show their skills in Monument Square on Friday night. 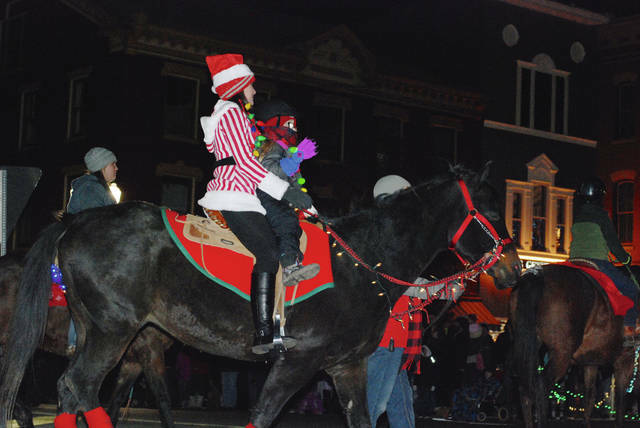 Santa Claus arrived in downtown Urbana Friday night led by a Holiday Horse Parade. Hundreds of people lined Monument Square to watch the parade of lighted and decorated horses stream west on Scioto Street before circling just east of the monument and doubling back up Scioto. Christmas music filled the air on the square. Food and other vendors stayed busy after the ceremonial lighting of the 15-foot Christmas tree in Legacy Park as the crowd waited for the parade. Urbana Mayor Bill Bean and Monument Square District volunteers were on hand to flip the switch on the tree. Now that Santa has arrived for the season, he has a regular schedule in Urbana. -Nov. 30 from 5 to 8 p.m.
-Dec. 1 from 11 a.m. to 2 p.m.
-Dec. 7 from 5 to 8 p.m.
-Dec. 8 from 11 a.m. to 2 p.m.
-Dec. 14 from 5 to 8 p.m.
-Dec. 15 from 11 a.m. to 2 p.m.
-Dec. 21 from 5 to 8 p.m.
-Dec. 22 from 11 a.m. to 2 p.m.